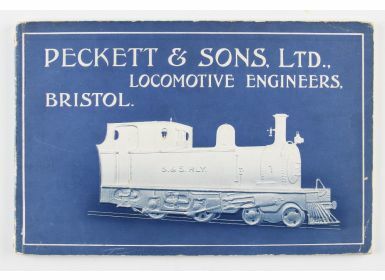 Peckett & Sons Ltd. Locomotive Engineers Bristol Circa 1920s - A 78 page catalogue illustrating and detailing with technical specifications various tank engine Locomotives they manufactured, many of which were narrow gauge. As well as full page photographs of their various locomotives there are a number of photographs of the workshops in their factory. This publication was produced for their railway customers & institutional shareholders. Printed on fine quality gloss paper, in blue and embossed card cover, size 9” × 6”.